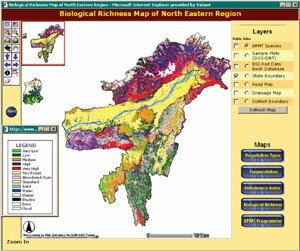 Biological richness map of northeastern region of India. There are about 15 networking institutes and organizations throughout India that are participating in the Bioprospecting and Molecular Taxonomy (BPMT) program, wherein some environmentally, medicinally, and economically important plant species are being studied, resulting in large amounts of generated data. These institutes and organizations include the Botanical Survey of India, the Central Institute of Medicinal and Aromatic Plants, the Department of Forest and Environment, the Indian Institute of Remote Sensing, and the Tata Energy Research Institute. One of the goals of those involved in the BPMT is the bringing together of their data and sharing their information for monitoring, analyzing, and planning programs for the conservation and preservation of India's biological wealth. This would create a well-calibrated system for data sharing that can be used for future rapid biodiversity assessments. To disseminate the biodiversity data within the BPMT group and to the public, the group launched the BIOSPEC Web site (www.biospec.org). This site provides one-point access to valuable biodiversity data from a multitude of distributed, diverse, and autonomous information sources (including Web-based sources). Support from this site comes from the government of India's Department of Space and Department of Biotechnology (DOS-DBT). There is a need to collate species-related information so that accessible, reliable, and accurate data with regard to the plant species habitat is available. BIOSPEC, a well-documented, computerized, and both spatial and nonspatial database query shell for plant species, can play a key role in helping to inventory the planet's biodiversity within a short time. Such a database, coupled with detailed site-specific field inventories, helps in identifying areas for bioprospecting. Owing to easy access via the Web, these derived maps will be able to receive maximum audience exposure and thus achieve the purpose of information propagation for real-time applications. The BPMT group performed a needs assessment and determined that Esri's distributor in India (NIIT-GIS Ltd. [Esri India]) could provide the consulting expertise that was crucial for development of the Web site. BIOSPEC is powered by a combination of Esri's ArcIMS and ArcSDE and New Atlanta Communications' (Alpharetta, Georgia) ServletExec. ArcIMS provides all Internet GIS functions; Java Servlets connect the map server to the Web server; and ArcSDE handles the collection, organization, and retrieval of data at the back end. Both the spatial and nonspatial biodiversity databases are assimilated into ArcSDE, which operates as an Oracle9i schema. The data queried by users is handled by the related tables, and information is retrieved collectively by a per user requirement. The nonspatial data maintained within this vast database includes sample points, species database, and tables with information of economic, medicinal, and ecological importance and tables of ecological parameters such as similarity indexes. BIOSPEC also provides species information from the Botanical Survey of India, Red Data books (Vols. 1 and 2), and on the species studied under the DOSDBT project. This information is being incorporated as geospatially distributed point data, which can be overlaid on the false color composite image of India within the Biome Level project (WiFS data). The DOSDBT project entitled Biodiversity Characterization at the Landscape Level Using Remote Sensing and Geographic Information System is a pioneering effort to create a geospatial database on vegetation type, disturbance regimes, and biological richness using imagery obtained by the Indian Remote Sensing Satellite. The vegetation type maps of different hot spot regions are prepared using a hybrid classification approach. The disturbance regime is an integration of fragmentation, porosity, interspersion, biotic human disturbance, and juxtaposition. The derivation of the biological richness is contributed with field sample plots in different vegetation stratums. It is generated using the ecosystem uniqueness, species richness, biodiversity value, terrain complexity, and disturbance index. The outputs of the Biodiversity Characterization at the Landscape Level Using Remote Sensing and Geographic Information System projectincluding false color composite images, vegetation type maps, fragmentation maps, disturbance index maps, and biological richness maps of biodiversity hot spots (northeast India, western Ghats, western Himalayas, and Andaman and Nicobars Islands)can be accessed, and then this information can be overlaid on each of these. The Survey of India's digital database of the entire country constitutes national, state, district, and taluk level boundaries, which have been used as baseline data. Also, additional data, such as road networks, settlements, and drainage, has been acquired from the Digital Chart of the World and overlaid with existing data sets. For more information, contact the authors at the Indian Institute of Remote Sensing, Dehra Dun, India-P.S. Roy (e-mail: psr@iirs.gov.in), Sameer Saran (e-mail: Sameer@iirs.gov.in), Nupoor Prasad (e-mail: nupoor@iirs.gov.in), or Harish Chandra Karnatak (e-mail: harish@iirs.gov.in) or visit the BIOSPEC Web site (www.biospec.org).